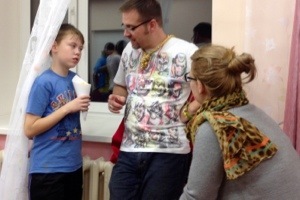 In Russia, on our way to the orphanage for the first morning with the kids it is always a wide array of emotions. It is one of my favorite moments of the trip, as those of us who have been before sit up straighter and crane our necks to see out of the front window to watch the landmarks count down until we arrive. This curve, that massive pothole, the bridge…the flatland, another curve. Worship music blasts in my ears as I beg God to fill me just a little bit more so that I am ready to pour myself out for him and his kids in the orphanage. The ‘newbies’ look around in confusion as though they are missing a very important part of this bumpy, crazy 20 minute long road. What they will soon understand is that they are missing the anticipation we carry of being back home.